Tropical paradise. Now with more zombies! For everything that doesn't actually exist in our world, it's substituted in some other form elsewhere. 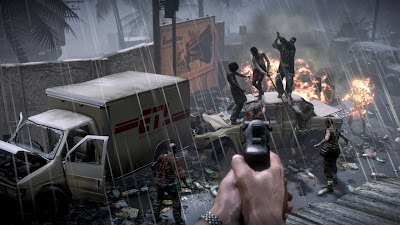 Video games being the prime example of handing a person a situation and trying to immerse them in it, and there have been a nice chunk of zombie-horror games to be released on all the consoles throughout the years, most recently being Dead Island. The game is set on the fictional tropical getaway known as Banoi. A lovely paradise for holiday makers, fun loving students, and rich business folk. Everything seems pretty good at first for the inhabitants of the island, until things turn sour when an infection spreads and sends most of the people into a crazy state of rage. 28 Days Later zombies, to be specific. But luckily for you and another three characters, you can't seem to be infected, so you set to work on helping the more vulnerable people around the island by collecting supplies and keeping others safe as you try to find a way off of the infected island. This game is visually brilliant, the island is huge and very well detailed. People look very realistic, although the lip syncing isn't the best, and the zombies are genuinly terrifying, most especially with the tons of gore that flies from their lacerated limbs. The main open world areas in the game all have their own specific style, and have plenty of twists and turns to explore with plenty of surprises. Though this game is practically full to the brim with odd glitches that pop out of nowhere. Quite a few times I had to restart the game because the game had frozen or just glitched out on my character. It makes you wonder whether the developers had spent just enough time on the game to truly polish up as much as they could and fix the cracks. The sounds in the game are good, which is a plus in a way, as you'll be hearing them quite a lot. Groaning and moaning from the zombies is pretty much constant in areas of infected, and sits alongside the heavy crunching and thumping of you beating them to a pulp. Like I said however, you'll be hearing this for most of the game, and there isn't much music to break it up, but that helps to add atmosphere. Atmosphere. Now that's where the game is let down for myself personally. It should immerse you, but Dead Island does this strange thing of bringing up cutscenes at major plot points and having the full entourage of characters there. If you're not playing online, this can be incredibly confusing. Even if you are, your companions could be at the complete other side of the map when you arrive at the next section. 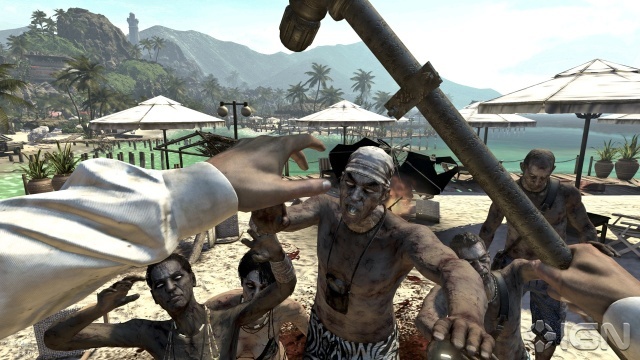 The way the characters just suddenly group together for something really put me off the way Dead Island progresses, as it just didn't seem right to my playing experience. As for immersing you with the actual gameplay, the game is definitely scary when you begin it, and you're flooded with a sense of panic as the situations unfold and everything seems rather hopeless. But any sense of 'survival' is lost after the first couple of times you die. It's inevitable, it's going to happen. 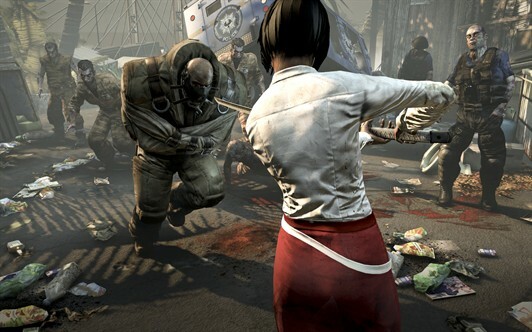 Zombies swarm you, and you just can't fight them all, nor can you hope to outrun them at times. When you die, what actually happens is that you lose some of your cash (which can reach ridiculous amounts as you progress through the game!) and have to wait ten seconds or so to respawn. It instantly loses the survival feeling that should accompany a zombie horror situation and turns into a more arcade style video game, which is a huge disappointment to me. And what makes this worse, is that the game can sometimes respawn you too close to where you died, and result in you being swarmed by a hungry horde once more! The need to survive was what made games like Left 4 Dead so brilliant and so this game loses points from me for that. But moving on from that, whilst this is my biggest disappointment with the game, it's still a very good and fun playthrough. Where this game falls a little flat, it makes up for it in it's gameplay. Hitting, beating, smashing, slicing, maiming, whacking and decapitating zombies is loads of fun, and you have a huge arsenal of weapons to choose from for the endless task of killing. And what makes it even better, is every weapon can be upgraded and customised at workbenches, making them stronger and twice as much fun! If you can manage to pull yourself away from purging Banoi of the infected, you'll find a huge array of side quests dotted around survivor camps and holdouts. Alongside the main quest, which has a good few hours of length to it, you'll find tons of other missions that will have you collecting, escorting and just generally helping out those in need. And as mentioned before, the island is absolutely huge, so plenty of chances to wander around and take in the view of a tropical island gone wrong. Co-op can be a bit of a hit and miss at times, depending on who you're playing with. Obviously, hooking up with some friends can always be fun, but when a cooperative game places you with strangers, it can be rather unpredictable at times. But the game matches you with other players you meet along the way about the same level and story progress, and allows you to jump in and out of sessions with them with ease. Whilst I didn't get quite enough hands on time online to make a decent verdict, I know that it's loads of fun with friends, not usually as fun without. 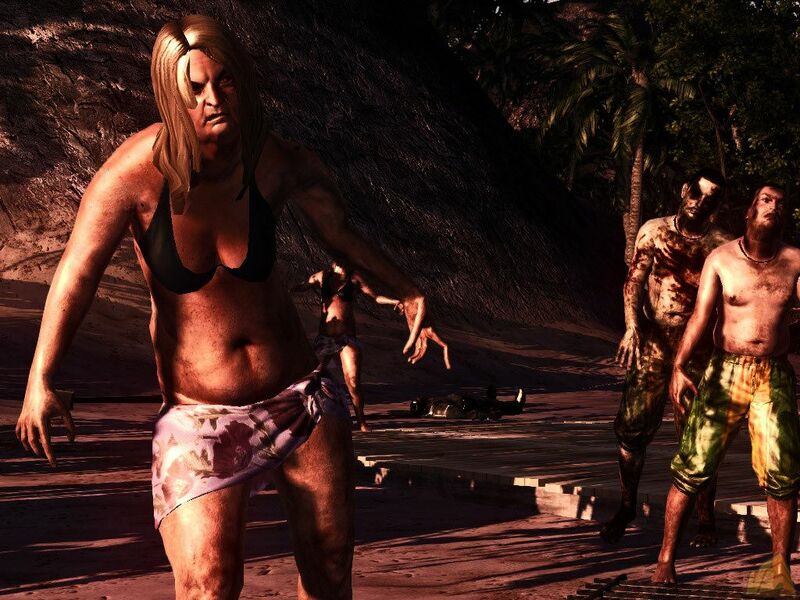 Dead Island is an enjoyable playing experience once you get the hang of it. It's definitely a step in the right direction for Zombie games, but isn't quite an innovating genius compared to say, Left 4 Dead. As for replay value, when you complete the game, you unlock the 'New Game+' feature that allows you to play the game through again with some new things, but there doesn't seem to be many major gameplay changes, though playing it through the first time around is definitely compelling enough to make you want to play it through at least a second time. The minor, but many bugs in the game can detract from the game, and the story and scripting can feel a little thin at times, but overall, Dead Island is a fun and exciting zombie apocalypse style game, that will definitely keep you amused if you've always dreamt of being a hero in such dire times! Now if you need me, I'll be boarding up the windows and waiting for the next epic zombie game to come my way. Or the apocalypse, we'll see which arrives first.